The street in front of the museum has been under construction for several weeks. Ultimately, the road will be repaved with stone. 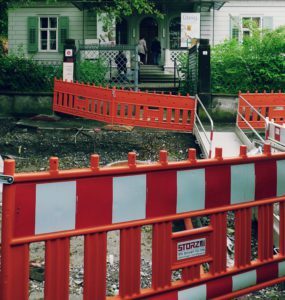 In the mean time, it is closed while workers tear out the asphalt, beginning laying the stones, and engage in other road-work-related activities. The pathway across the street leading to the museum. I do most of my work in the library building across the street from the museum, so I cross through the construction zone several times each day. 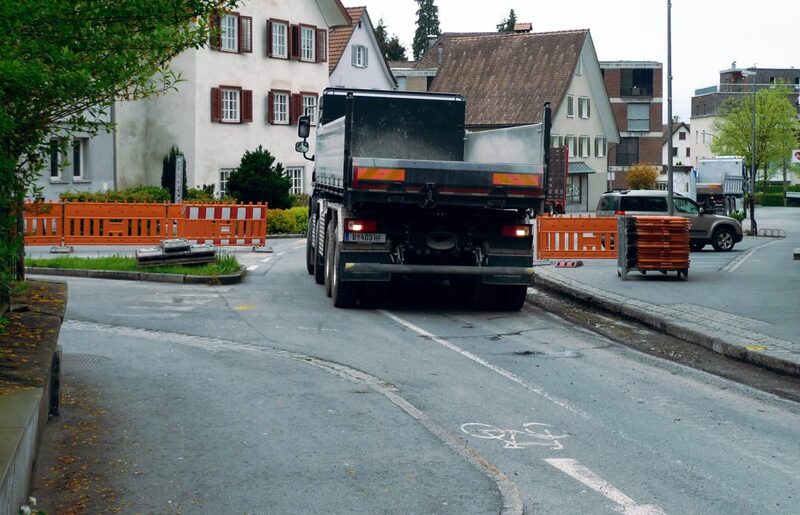 Although the construction poses a slight inconvenience to museum goers, it is a great source of joy and amusement for the many young Hohenems residents who like to watch the trucks. A view of the construction site on a recent rainy day. -My German language skills. (I can introduce myself and count to ten now, which is progress). -Austria’s national football team. (Or soccer, if you’re in America). Austria qualified for the European Championships, which is a big deal, seeing as their record in international football has historically been dismal. (Previously, the only year they had qualified was 2008, when they auto-qualified as co-hosts of the tournament. That year, over 10,000 fans signed a petition to have the team pull out of the tournament to avoid humiliation. The team did not withdraw, but they were eliminated in the first round). Austria plays Hungary* in their opening match at 18:00 (Central European Time) on Tuesday, June 14. -My typing skills. The German keyboard is slightly different than the English one—most notably, the letters “y” and “z” are swapped and the German keyboard has several characters that the English one doesn’t. -Plans for the 2017 Hohenems reunion. I’ll keep you posted! *Yes, there are many jokes about Austria-Hungary once being a single country. The museum’s current temporary exhibition is titled Übrig. While I don’t know much German, I’ve been told that übrig is a word that doesn’t translate well into English. The exhibition’s official English title is “odd,” which is one way to interpret the word. But übrig also implies a sense of being leftover, or left behind. I had a chance to visit the Übrig exhibit a few days ago alongside some art history students from Vienna. 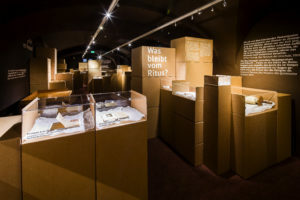 It’s an exhibition made up of leftovers: the items included are mostly from the museum’s archives but, for one reason or another, they had not previously been displayed. The items in the Übrig exhibit—though a odd collection—are each fascinating. On display, they are grouped by theme. A collection of locks and keys cut from the doors of Hohenems’ formerly Jewish homes accompanies a ripped piece of Torah scroll that a German soldier had used to send a package home. In another room, a friendship book and a piece of sheet music entitled “Faith-Love-Hope“ (written by a Hohenems emigré living in the United States) create a sense of optimism and resiliency. Still, the appearance of these objects in the museum signifies a disruption from their intended use. A Torah scroll and mitzvoh plates, for example, do not serve their religious purposes when they are behind the museum glass. The bicycle that sits in another room belonged to a Jewish man who was deported from Hohenems in 1939 and murdered in 1942. No one is riding it. In some ways, übrig might be an appropriate way to characterize the Jewish history of Hohenems. The town no longer has a Jewish community; the museum itself tells of a past that has been left behind. 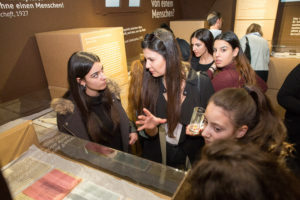 After visiting the exhibit, the Viennese students engaged in a discussion about a number of things they had seen. One issue they brought up was the place for the Holocaust in Jewish museums. Obviously, Jewish history is much deeper and richer than those events; on the other hand, failure to include the Holocaust as a part of Jewish history might risk forgetting or denying it. I was interested in the perspective that the students brought as pupils of art history. I didn’t initially think about the items in the museum (including the Übrig exhibition) as art. However, the idea of art is an interesting way to examine the exhibit. At a basic level, the purpose of art is to be looked at and hopefully challenge the viewer to see something differently. In this way, the Torah scroll or the mitzvoh plates or the bicycle—though deprived of their original uses—take on a new purpose. That purpose involves educating the art students, the young kids who visited the museum earlier that day, the man visiting from Bangladesh who I met yesterday, and so many others. It might seem odd, but it’s definitely worthwhile. I was around six years old when my grandmother first told me the story of how she’d immigrated to the United States from Austria. It was a watered-down version of her tale; she didn’t want to scare me so she emphasized the food on the boat, not the reasons why her family had left. When I was six, Austria seemed like a mythical place to me, like a Narnia or Hogwarts. But I grew up, found Hohenems on a map, and eventually learned how to spell it. I studied the Holocaust in school. The word diaspora entered my vocabulary. Shortly after my eleventh birthday, I visited Hohenems for the first time. The next time my grandmother told me the story, she told me about Kristallnacht and how difficult it was to get an American visa. Having finished my first year at university, I’m returning to work at the museum this summer. Now, of course, I know that my family’s story isn’t unique. Hohenems is a very real place and my ancestors’ history in the town intersects with that of so many other people. As a member of the diaspora, their legacy impacts me too. And the broader concepts at play in Hohenems—issues like coexistence and migration—affect nearly everyone. I look forward to spending the summer in Hohenems. More importantly, I look forward to deepening my understanding of Jewish history while connecting with and learning from other members of the diaspora. You’ll definitely be hearing more from me. I’d love to hear from you too—don’t hesitate to reach out. We look forward to sharing stories here with you this summer and leading up to the 2017 reunion. Please check back for updates!